Kimchiland tour (Part 2) | Kimchi with Eish! Here are 2 more visual guides I made to give a little clearer insight into the doing and screwings of this crazy place !!! Korean culture can basically be summed up in one word – SHARING!!! They share absolutely everything. Whenever I go to pizza place with another foreigner and we order 2 pizzas …, well the look we get can only be the same the lepers got way back when! Macdonald’s will cheerfully cut a Big Mac in half and give 2 straws with the not supersized drink! And it’s not only food. Koreans share everything. From their culture with a bunch of brainwashed commies to a country the size of the Free State but with a population the same as South Africa! They had to share! Now I have nothing against the sharing and I can tolerate the stares when I walk with MY pizza down the street! It’s just that somewhere in all the sharing Koreans have lost their individuality (that’s to say they if they ever had it). Conformity is way of life here on the peninsula and individualists are as rare as a fish and chips joint in the middle of the Sahara! One such a conformists action is something I like to call “double dressing”. For one or other reason not even a NASA rocket scientists would be able to figure out couples LUUUUUUUV to dress alike. That’s right they look the same. From top to bottom. It’s wierd but thoroughly amusing at the same time. Now there are some rumors about the purpose of double dressing but no one could confirm any of this to me! Some say that it is a show of celebration for the 100 day anniversary. Whoop whoop. Others believe it declares the date on which the, you now, deed will be done! Then there are those that say it’s just because they are retarded. I don’t know. The fact that I missed the World Cup back has been responsible for some depressed moods but I must say that the Korean ‘gees’ has made up for it. Never in my life have I experienced such a unified cheering front before. Cheers of dae han min guk, dae han min guk echo through your soul and get you so excited that only a loss against Uruguay can burst the bubble! The World cup isn’t over yet but both Korea and South Africa are out, thus meaning a lot more sleep for me! 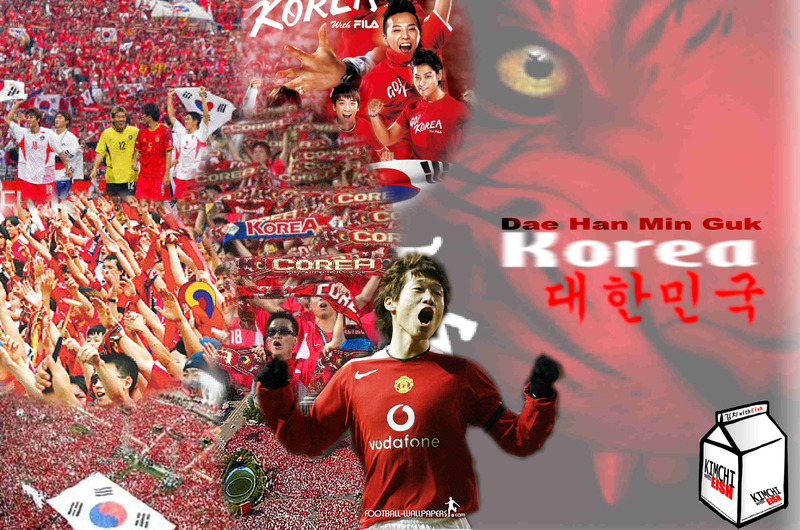 Koreans are wonderful supporters and it is so easy to get swept up in their euphoria and pride! Experiencing the World Cup in Korea has ben great! A full post just on the World Cup will follow soon! if you scroll down a bit, there’s some interesting explanations and commentary on the idea of “conformity” vs. “individuality” in korea. Y’know, I never realized that. When I buy something like a shaved red bean frostie from Lotte– they always give me 2 spoons so I always have to pitch one. The double-dressing tho, I”m still trying to figure out. There’s gotta be more to that than just matching, huh?